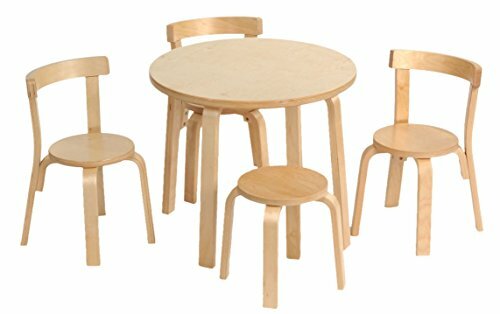 S8501 Color: Natural Features: -Stool is a great feature as it allows a parent to come down to the child's level for play.-Sturdy pieces are designed for use from generation to generation.-Classic Scandinavian design will fit into any home.-Set offers a durable and family-friendly table for children from two years of age.-Seat - 12'' seat H and 20.5'' overall height.-Weight capacity for the chairs and table is 250 lbs. Includes: -Set includes a table, three chairs and a stool. Dimensions: -Table - 20'' H x 23.3/4W''. If you have any questions about this product by Svan, contact us by completing and submitting the form below. If you are looking for a specif part number, please include it with your message.